Above: Revised illustration of Achillobator giganticus with corrected leg proportions. Scale bar = 500 mm. By Matt Martyniuk, all rights reserved. "I've hunted most things that can hunt you, but the way these things move..."
"Cheetah speed. Fifty, sixty miles an hour if they ever got out into the open, and they're astonishing jumpers." This quote from the original Jurassic Park film did much to cement the image of dromaeosaurids, the raptor* dinosaurs, in the public consciousness as fleet-footed hyper predators. Despite being nearly 20 years old, this portrayal has by and large remained unchanged in popular culture, with raptors often stock monsters with near-supernatural murderous abilities in everything from tongue-in-cheek xkcd comics to (I hope) tongue-in-cheek made for SyFy movies. *Yes, I'm going to commit a cardinal sin and refer to dromies as "raptors". "Raptor" in ornithology refers to most predatory birds, even those that hunt on the ground (the Raptor Research Foundation considers Secretarybirds to be raptors). Since dromaeosaurids were both predatory and birds under any sane definition of the word, there should be no problem referring to them as an extinct group of raptors. But were raptors really particularly fast? Bipedal running speed in digitigrade animals (that is, those that walk on their toes like birds rather than their ankles like humans) is usually roughly determined by the ratio of the lower leg bones (the tibia/tibiotarsus) to the upper foot bones (the metatarsus). The longer the upper foot is in length compared to the lower leg, the faster an animal could run. Therefore, we would expect the fastest theropod dinosaurs to be those with the longest metatarsi relative to tibiae. A prime example of a theropod specialized for running very very quickly are the parvicursorines. This specialized group of alvarezsaurids (strange theropodan insectivores with stout, powerful arms each bearing one very large claw) has among the longest lower leg to upper leg ratio of any Mesozoic dinosaur group. Looking at the statistics compiled by Mickey Mortimer at The Theropod Database (a phenomenal resource I turn to so often I really should just make it my browser's home page), the type specimen of Parvicursor remotus (see leg diagram here) has a femur 52.6 mm long, a tibiotarsus about 75.6 mm long, and a metatarsus 58 mm long. The functional lower leg is 113 mm long, well over twice the length of the upper leg. More importantly, the lower leg and upper foot bones were fairly close to being equal in length. This animal was clearly a speed demon. How does this compare to raptors? If, as Jurassic Park claimed, raptors were exceptionally fast, we would expect them to have similarly long lower legs. The terrifyingly human-sized raptors in JP were a Hollywood invention, but we do know of raptor species slightly smaller and slightly larger than they were. On the smaller side were the famous Deinonychus antirrhopus. According to TTD, the femora of one relatively complete specimen measured 248 mm, with a tibia 324 mm long, and a metatarsus 151 mm long. Again, the total lower leg length is nearly double the upper leg. But the upper foot bones were only half as long as the lower leg bones. The "fast raptor" meme was started by John Ostrom himself, when he first described Deinonychus in 1969. This was merely speculation on his part, as the hind limb was not completely known in the first specimens. Ostrom actually changed his opinion in later papers, finding that the femur was shorter than he'd initially thought, and that the foot bones were surprisingly short compared to other dinosaurs. Not only was Deinonychus not particularly fast, it probably could not have been nearly as fast as most other small theropods, including modern flightless birds, let alone cheetahs. Another very popular type of raptors are advanced giant dromaeosaurines (Utahraptor and Achillobator). I recently found myself revising an older drawing of an Achillobator giganticus, which were, as mentioned above, only slightly larger than the Jurassic Park raptors. Many young dinosaur fans are very attached to these species in part because they're much larger than most other raptors, and because they had a slightly anthropomorphized novel written about them by Bob Bakker shortly after JP was released (Raptor Red). As a result, these big birds have a cachet in the collective consciousness similar to the generally more famous Deinonychus and Velociraptor--that of super-fast, agile and intelligent predators. However, when finishing up my revised drawing, I had to double check the proportions several times to make sure I wasn't screwing it up. To my amazement, the legs, particularly the lower legs and upper foot bones, looked almost laughably short. Again according to TTD, the femur of A. giganticus measures 505 mm long, the tibia 490 mm long, and the metatarsus a paltry 234 mm long--less than half the length of the tibia. Not only is the metatarsus much, much shorter than the tibia, the entire lower leg in only marginally longer than the femur! 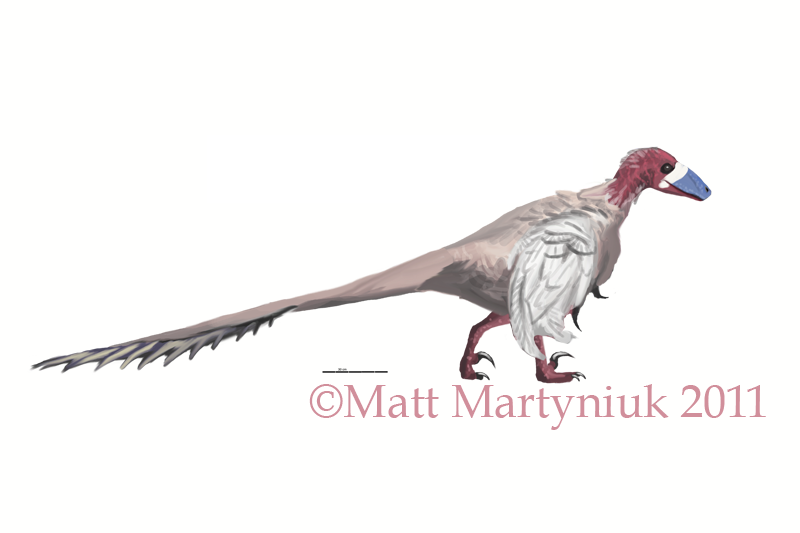 The first thing that struck me wen looking at my own reconstruction was that this looked like the dromaeosaurid equivalent of Majungasaurus, those abilisaurids with the ludicrously short legs (which, coincidentally like Achillobator, have been suggested to be made up of chimeric specimens). It is also reminiscint of another stout-legged dromaeosaurid species, Balaur bondoc. While Balaur have been suggested to be possibly herbivorous due to these strange proportions, partial jaws and some teeth of Achillobator confirm that they were carnivores. But with legs like those, it's hard to imagine these creatures behaved the way the public imagines raptors to have done, chasing down fast moving prey. Frankly, it's hard to imagine Achillobator doing much beyond waddling across Nemegtian lake shores hunting turtles in epic slow-motion chases. For the record, no described specimen of Utahraptor preserves both a femur, a tibia, and a metatarsus, so it's impossible to say whether or not they had the same squat proportions (unless somebody has some more detailed information on the numerous undescribed specimens in the BYU collections). For now, it would be safe to assume that they, too, would have been a laughing stock if they were caught trying to run. Ok, but why would predatory animals have such stubby legs? There is a lot of evidence that dromaeosaurids were specialized for hunting big game, often animals larger than themselves. Deinonychus are infamous for their association with large ornithopods Tenontosaurus tilletti, and while evidence suggests they mainly targeted juveniles (Forster 1984), these were still much larger in terms of weight than even adult Deinonychus. Velociraptor are known to have grappled with the larger Protoceratops, and even a rumored specimen of a Microraptor apparently preserves evidence that they tackled prey larger than themselves. The short legs, especially the short foot bones, seem to be linked with the function of the large sickle-claw, making lack of speed a trade-off for improved ability to grapple and kill large game. Dinosaurs like Tenontosaurus and Protoceratops probably weren't particularly fast-moving themselves, making this sacrifice in speed worthwhile for the chance to down a massive animal that could provide a whole lot of food. In the end, while the raptor chase scenes in Jurassic Park remain some of the most exciting parts of the movie, they require a significant amount of disbelief to be suspended; after all, it would be more realistic but slightly less suspenseful if Laura Dern had been able to evade the raptors in the power bunker by simply breaking into a light jog. Do modern ambush predators typically have legs made for running? Something tells me they don't, but I'm not sure. Cheetahs are obviously built for speed, but you don't usually see felids like bobcats or mountain lions doing a lot of running after prey, but rather lying in wait until something wanders by. Jaguars even sometimes attack from a tree above the prey animal. Perhaps dromaeosaurs led a similar lifestyle? Excellent post. Now I can't unsee the "epic slow-motion turtle chase". I pointed out ages ago (well, back in the 1990s) that the dromaeosaurids known at the time were stocky-footed animals, and that felids were a likely analog. "Again according to TTD, the femur of A. giganticus measures 505 mm long, the tibia 490 mm long, and the metatarsus a paltry 234 mm long--less than half the length of the tibia. Not only is the metatarsus much, much shorter than the tibia, the entire lower leg in only marginally longer than the femur!" By "entire lower leg," do you mean tibia + metatarsus? Using those numbers, the lower leg is 1.43 times longer than the femur. Not so marginal if you ask me. "...it would be more realistic but slightly less suspenseful if Laura Dern had been able to evade the raptors in the power bunker by simply breaking into a light jog." Humans have fairly short lower legs and feet relative to the femur as well. Why would we be any faster than large dromaeosaurids? "Not so marginal if you ask me." It is compared to _Parvicursor_, where the MT+tibiotarsus is over twice the femoral length! "Why would we be any faster than large dromaeosaurids?" (Of course, the stride length is obviously greater than ours, so it may have been able to catch Ellie without actually breaking into a run). "birds under any sane definition of the word"
"Bird" originally referred only to juvenile members of extant avian species. Nowadays it is generally used to refer to avians (especially neoavians), and, in paleontological contexts, various groups including avians and [often] some stem-avians. In short, its meaning is shifting and its boundary is fuzzy. There's no such thing as "the one sane definition". Use it however you like, but don't call the rest of us crazy if we use it differently. Yeah, I may have gotten a bit too hyperbolic there. But as for "various groups including avians and [often] some stem-avians", I've never read a single relevant piece of literature that did not refer to _Confuciusornis_ or even _Jeholornis_ as birds. I know a lot of people would take issue with that and that's fine, but that's the vast majority use. On the other hand, I think it makes zero logical sense to call _Jeholornis_ a bird and _Microraptor_ a non-bird. At least the two or three people online who call _Aves_ birds and _Ichthyornis_ non-birds are being internally consistent. The "cheetah speed" thing was originally bring up by Michael Crichton, which is odd considering his raptor is actually non-described Achillobator. But one can't blame him since at that time raptors aren't that well known. And "raptor" is so largely associated with dromaeosaurs that using the term for these carnivorous theropods should be mainstream even though it isn't correct, but refer to Komodo monitors as "dragons" isn't correct either, is it? Sure enough, derived dromaeosaurids have a lower ratio than just about anything except therizinosaurs. It's interesting that in birds the tarsometatarsus is so elongate, and yet the femur is held horizontally and often very short (and in birds this and the musculature is responsible for the 'waddle'). One would expect that in the closer dinosaur relatives of birds, that we'd see a great extension of the tarsometatarsus, and yet here is the Alvarezsaurids that have that feature (and for a time these guys were thought to be birds, and I think GSP still considers them to possibly be neo-flightless "birds"). I wonder if lengthening correlates with 'degree of fusion' too? As if on cue, the new Deinonychus hunting paper addresses this as well. "In the end, while the raptor chase scenes in Jurassic Park remain some of the most exciting parts of the movie, they require a significant amount of disbelief to be suspended; after all, it would be more realistic but slightly less suspenseful if Laura Dern had been able to evade the raptors in the power bunker by simply breaking into a light jog." While I do get what you're saying (I've read more-or-less the same thing from Holtz: http://dml.cmnh.org/1994Dec/msg00123.html ), the above quote seems a bit exaggerated: Based on what I've read (E.g. See the following links & quote), Utahraptor & Achillobator probably weren't as fast as Velociraptor & Deinonychus (About 25 mph: http://dml.cmnh.org/2008Aug/msg00031.html ), but were probably faster than a pro athlete (About 17.7 mph: http://www.livescience.com/9519-rex-outrun-humans.html ). Quoting Hartman ( http://shartman.deviantart.com/art/Plunderer-from-Utah-179491659?offset=75#comments ): "Utahraptor seems to have pretty allosaur-like distal limb proportions, so it may well have had a similar top speed (whatever that speed was)." Yes, as I said above it was meant as hyperbole, certainly a large dromaeosaur would be as fast or faster as the average human due simply to greater stride length. However I'd question whether unpublished estimates for generic "dromaeosaurids" are useful. I don't know of any published speed estimates for any particular eudromaeosaur but as Holtz, Ostrom and others have noted, the peculiar limb proportions indicate that they would have been among the slower theropods. And there's no evidence Allosaurus was particularly fast either: the only study I know of is nearly 15 years old and estimated their top speed at between 30 and 55 kph. "Yes, as I said above it was meant as hyperbole,"
My bad. I didn't read the other comments b-4 posting mine. "don't know of any published speed estimates for any particular eudromaeosaur but as Holtz,"
"the only study I know of is nearly 15 years old and estimated their top speed at between 30 and 55 kph." There's Sellers & Manning 2007 ( http://rspb.royalsocietypublishing.org/content/274/1626/2711.short ) for both Velociraptor & Allosaurus. "And there's no evidence Allosaurus was particularly fast either:"
Animals traditionally known for being slow and ponderous, such as hippos, can run surprisingly fast for short distances. Might this also be true for large dromies? Please get rid of that extreme hyperbole-even at "only" 30m/hr there's no way even Usain Bolt could outrun a raptor.